"ICBM" redirects here. For the geotag, see ICBM address. An Intercontinental Ballistic Missile (ICBM) is a ballistic missile with a maximum range of more than 5,500 kilometres (3,400 mi) typically designed for nuclear weapons delivery (delivering one or more nuclear warheads). Most modern designs support multiple independently targetable reentry vehicles (MIRVs), allowing a single missile to carry several warheads, each of which can strike a different target. Early ICBMs had limited accuracy and that allowed them to be used only against the largest targets such as cities. They were seen as a "safe" basing option, one that would keep the deterrent force close to home where it would be difficult to attack. Attacks against military targets, if desired, still demanded the use of a manned bomber. Second and third generation designs dramatically improved accuracy to the point where even the smallest point targets can be successfully attacked. Similar evolution in size has allowed similar missiles to be placed on submarines, where they are known as submarine-launched ballistic missiles, or SLBMs. Submarines are an even safer basing option than land-based missiles, able to move about the ocean at will. This evolution in capability has pushed the manned bomber from the front-line deterrent forces, and land-based ICBMs have similarly given way largely to SLBMs. ICBMs are differentiated by having greater range and speed than other ballistic missiles: intermediate-range ballistic missiles (IRBMs), medium-range ballistic missiles (MRBMs), short-range ballistic missiles (SRBMs)—these shorter range ballistic missiles are known collectively as theatre ballistic missiles. There is no single, standardized definition of what ranges would be categorized as intercontinental, intermediate, medium, or short. The development of the world's first practical design for an ICBM, A9/10, intended for use in bombing New York and other American cities, was undertaken in Nazi Germany by the team of Wernher von Braun under Projekt Amerika. The ICBM A9/A10 rocket initially was intended to be guided by radio, but was changed to be a piloted craft after the failure of Operation Elster. The second stage of the A9/A10 rocket was tested a few times in January and February 1945. The progenitor of the A9/A10 was the German V-2 rocket, also designed by von Braun and widely used at the end of World War II to bomb British and Belgian cities. All of these rockets used liquid propellants. Following the war, von Braun and other leading German scientists were relocated to the United States to work directly for the U.S. Army through Operation Paperclip, developing the IRBMs, ICBMs, and launchers. The Soviet R-36 (SS-18 Satan) is the largest ICBM in history, with a Throw weight of 8,800 kg, twice that of Peacekeeper. World's first ICBM and orbital launch vehicle: Korolyov's R-7 Semyorka. It was the same R-7 launch vehicle that placed the first artificial satellite in space, Sputnik, on 4 October 1957. The first human spaceflight in history was accomplished on a derivative of R-7, Vostok, on 12 April 1961, by Soviet cosmonaut Yuri Gagarin. A deeply modernized version of the R-7 is still used as the launch vehicle for the Soviet/Russian Soyuz spacecraft, marking more than 50 years of operational history of the original Sergei Korolyov's rocket design. The U.S. initiated ICBM research in 1946 with the MX-774 project. This was a three-stage effort with the ICBM development not starting until the third stage. However, funding was cut after only three partially successful launches in 1948 of the second stage design, used to test variations on the V-2 design. With overwhelming air superiority and truly intercontinental bombers, the newly forming US Air Force did not take the problem of ICBM development seriously. Things changed in 1953 with the Soviet testing of their first hydrogen bomb, but it was not until 1954 that the Atlas missile program was given the highest national priority. 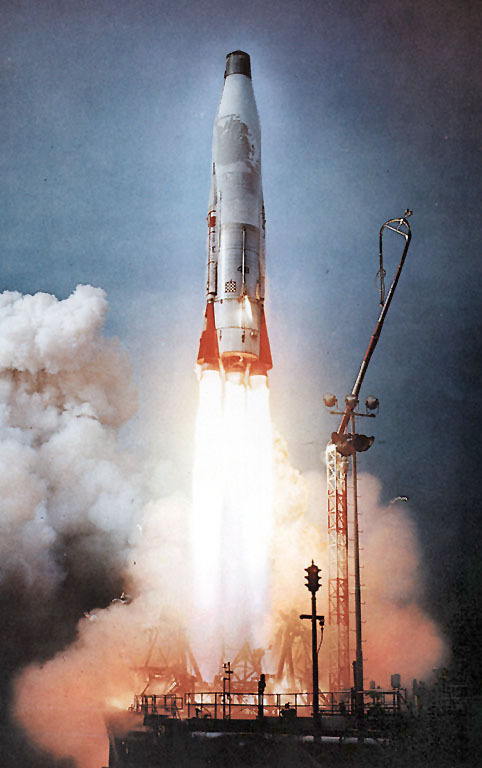 The Atlas A first flew on 11 June 1957; the flight lasted only about 24 seconds before the rocket blew up. The first successful flight of an Atlas missile to full range occurred 28 November 1958. The first armed version of the Atlas, the Atlas D, was declared operational in January 1959 at Vandenberg, although it had not yet flown. The first test flight was carried out on 9 July 1959, and the missile was accepted for service on 1 September. The R-7 and Atlas each required a large launch facility, making them vulnerable to attack, and could not be kept in a ready state. Failure rates were very high throughout the early years of ICBM technology. Human spaceflight programs (Vostok, Mercury, Voskhood, Gemini, etc.) served as a highly visible means of demonstrating confidence in reliability, with successes translating directly to national defense implications. The US was well behind the Soviet Union in the Space Race, so U.S. President John F. Kennedy increased the stakes with the Apollo Program, which used Saturn rocket technology that had been funded by President Dwight D. Eisenhower. In the 1980s, President Ronald Reagan launched the Strategic Defense Initiative as well as the MX and Minuteman ICBM programs. As of 2015[update], all five of the nations with permanent seats on the United Nations Security Council have operational long-range ballistic missile systems: all except China have operational submarine-launched missiles, and Russia, the United States and China also have land-based ICBMs (the US' missiles are silo-based, China and Russia have both silo and road-mobile missiles). India successfully test fired Agni V, with a strike range of more than 5,000 km (3,100 mi) on 19 April 2012, claiming entry into the ICBM club. boost phase: 3 to 5 minutes (shorter for a solid rocket than for a liquid-propellant rocket); altitude at the end of this phase is typically 150 to 400 km (93 to 249 mi) depending on the trajectory chosen, typical burnout speed is 7 km/s (4.3 mi/s), up to the speed of Low Earth Orbit. midcourse phase: approx. 25 minutes—sub-orbital spaceflight in an elliptic flightpath; the flightpath is part of an ellipse with a vertical major axis; the apogee (halfway through the midcourse phase) is at an altitude of approximately 1,200 km (750 mi); the semi-major axis is between 3,186 and 6,372 km (1,980 and 3,959 mi); the projection of the flightpath on the Earth's surface is close to a great circle, slightly displaced due to earth rotation during the time of flight; the missile may release several independent warheads, and penetration aids such as metallic-coated balloons, aluminum chaff, and full-scale warhead decoys. reentry phase (starting at an altitude of 100 km (62 mi)): 2 minutes – impact is at a speed of up to 4 km/s (2.5 mi/s) (for early ICBMs less than 1 km/s (0.62 mi/s)); see also maneuverable reentry vehicle. Modern ICBMs typically carry multiple independently targetable reentry vehicles (MIRVs), each of which carries a separate nuclear warhead, allowing a single missile to hit multiple targets. MIRV was an outgrowth of the rapidly shrinking size and weight of modern warheads and the Strategic Arms Limitation Treaties which imposed limitations on the number of launch vehicles (SALT I and SALT II). It has also proved to be an "easy answer" to proposed deployments of ABM systems—it is far less expensive to add more warheads to an existing missile system than to build an ABM system capable of shooting down the additional warheads; hence, most ABM system proposals have been judged to be impractical. 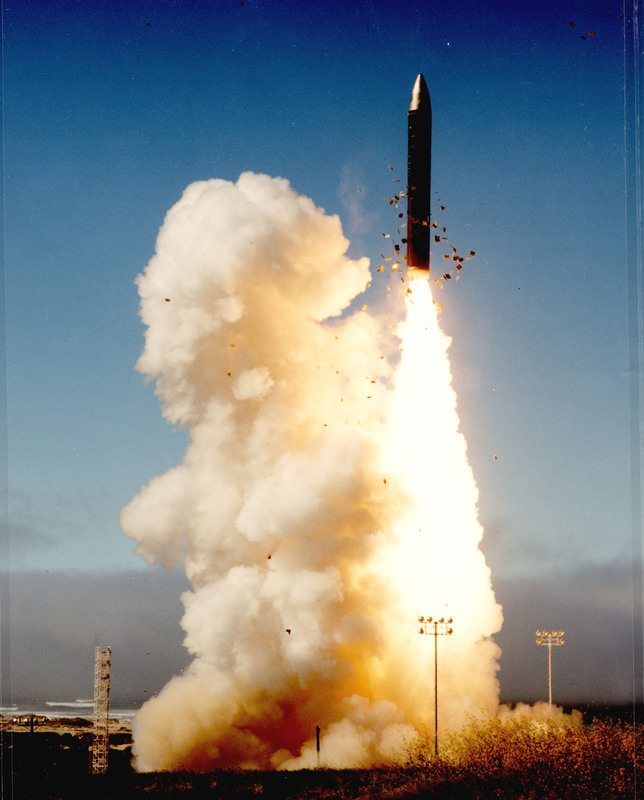 The first operational ABM systems were deployed in the U.S. during 1970s. Safeguard ABM facility was located in North Dakota and was operational from 1975 to 1976. The USSR deployed its Galosh ABM system around Moscow in the 1970s, which remains in service. Israel deployed a national ABM system based on the Arrow missile in 1998, but it is mainly designed to intercept shorter-ranged theater ballistic missiles, not ICBMs. The US Alaska-based National missile defense system attained initial operational capability in 2004. ICBMs can be deployed from TELs such as the Russian Topol. In flight, a booster pushes the warhead and then falls away. Most modern boosters are solid-fueled rocket motors, which can be stored easily for long periods of time. Early missiles used liquid-fueled rocket motors. Many liquid-fueled ICBMs could not be kept fuelled all the time as the cryogenic liquid oxygen boiled off and caused ice formation, and therefore fueling the rocket was necessary before launch. This procedure was a source of significant operational delay, and might allow the missiles to be destroyed by enemy counterparts before they could be used. To resolve this problem the British invented the missile silo that protected the missile from a first strike and also hid fuelling operations underground. Once the booster falls away, the warhead continues on an unpowered ballistic trajectory, much like an artillery shell or cannonball. The warhead is encased in a cone-shaped reentry vehicle and is difficult to detect in this phase of flight as there is no rocket exhaust or other emissions to mark its position to defenders. The high speeds of the warheads make them difficult to intercept and allow for little warning striking targets many thousands of kilometers away from the launch site (and due to the possible locations of the submarines: anywhere in the world) within approximately 30 minutes. Many authorities say that missiles also release aluminized balloons, electronic noisemakers, and other items intended to confuse interception devices and radars (see penetration aid). As the nuclear warhead reenters the Earth's atmosphere its high speed causes compression of the air, leading to a dramatic rise in temperature which would destroy it if it were not shielded in some way. As a result, warhead components are contained within an aluminium honeycomb substructure, sheathed in pyrolytic graphite-epoxy resin composite, with a heat-shield layer on top which is constructed out of 3-Dimensional Quartz Phenolic. Accuracy is crucial, because doubling the accuracy decreases the needed warhead energy by a factor of four. Accuracy is limited by the accuracy of the navigation system and the available geophysical information. Strategic missile systems are thought to use custom integrated circuits designed to calculate navigational differential equations thousands to millions of times per second in order to reduce navigational errors caused by calculation alone. These circuits are usually a network of binary addition circuits that continually recalculate the missile's position. The inputs to the navigation circuit are set by a general purpose computer according to a navigational input schedule loaded into the missile before launch. One particular weapon developed by the Soviet Union (FOBS) had a partial orbital trajectory, and unlike most ICBMs its target could not be deduced from its orbital flight path. It was decommissioned in compliance with arms control agreements, which address the maximum range of ICBMs and prohibit orbital or fractional-orbital weapons. China has developed several long range ICBMs, like the DF-31. The Dongfeng 5 or DF-5 is a 3 stage liquid fuel ICBM and has an estimated range of 13,000 kilometers. The DF-5 had its first flight in 1971 and was in operational service 10 years later. One of the downsides of the missile was that it took between 30 and 60 minutes to fuel. The Dong Feng 31 (a.k.a. CSS-10) is a medium-range, three-stage, solid-propellant intercontinental ballistic missile, and is a land-based variant of the submarine-launched JL-2. The DF-41 or CSS-X-10 can carry up to 10 nuclear warheads, which are maneuverable reentry vehicles and has a range of approximately 12,000–14,000 km (7,500–8,700 mi). India has a series of ballistic missiles called Agni, of which the latest is Agni-V. On 19 April 2012, India successfully test fired its first Agni-V, a three stage solid fueled missile, with a strike range of more than 5,000 km (3,100 mi). The missile was test-fired for the second time on 15 September 2013. All current designs of submarine launched ballistic missiles have intercontinental range. Current operators of such missiles are the United States, Russia, United Kingdom, France and The Peoples Republic of China. India has developed the K-15 Sagarika, and is working on the long range K-4 missile, which is part of the K Missile family. ↑ "Intercontinental Ballistic Missiles". Special Weapons Primer. Federation of American Scientists. http://www.fas.org/nuke/intro/missile/icbm.htm. Retrieved 2012-12-14. ↑ Dolman, Everett C.; Cooper, Henry F., Jr. "19: Increasing the Military Uses of Space". Toward a Theory of Space Power. NDU Press. http://www.ndu.edu/press/space-Ch19.html. Retrieved 2012-04-19. ↑ Correll, John T. (July 2005). "How the Air Force got the ICBM". Airforce Magazine. http://www.airforce-magazine.com/MagazineArchive/Pages/2005/July%202005/0705icbm.aspx. Retrieved 2012-04-19. ↑ Wade, Mark. "R-7". Encyclopedia Astronautica. http://www.astronautix.com/lvs/r7.htm. Retrieved 2011-07-04. ↑ "This Week in EUCOM History: February 6–12, 1959". EUCOM. 6 February 2012. http://www.eucom.mil/article/23076/this-week-in-eucom-history-february-6-12-1959. Retrieved 2012-02-08. ↑ "Atlas". The Exploration of Space. Century of Flight. 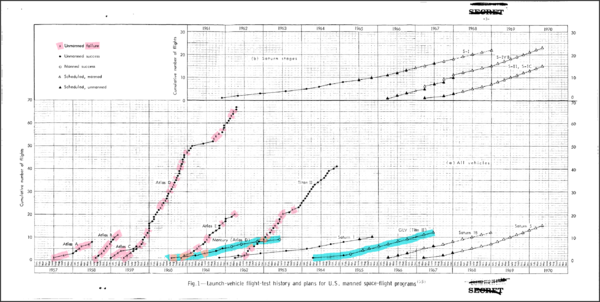 http://www.century-of-flight.net/Aviation%20history/space/Atlas.htm. Retrieved 2012-12-14. ↑ "Atlas". Encyclopedia Astronautica. Astronautix. http://www.astronautix.com/lvs/atlas.htm. Retrieved 2012-04-19. ↑ "DF-5". Weapons of Mass Destruction / WMD Around the World. Federation of American Scientists. https://www.fas.org/nuke/guide/china/icbm/df-5.htm. Retrieved 2012-12-14. ↑ "Type 92 Xia". Weapons of Mass Destruction Around the World. Federation of American Scientists. https://www.fas.org/nuke/guide/china/slbm/type_92.htm. Retrieved 2012-12-14. ↑ 11.0 11.1 Feickert, Andrew (5 March 2004). "﻿Missile Survey: Ballistic and Cruise Missiles of Foreign Countries﻿" (PDF). Congressional Research Service (Library of Congress). RL30427. http://www.au.af.mil/au/awc/awcgate/crs/rl30427.pdf. Retrieved 2010-06-21. ↑ 12.0 12.1 Pfeffer, Anshel (2 November 2011). "IDF test-fires ballistic missile in central Israel". Haaretz. http://www.haaretz.com/news/diplomacy-defense/idf-test-fires-ballistic-missile-in-central-israel-1.393306. Retrieved 2011-11-03. ↑ 13.0 13.1 Mallikarjun, Y; Subramanian, TS (19 April 2012). "Agni-V successfully test-fired". The Hindu. http://www.thehindu.com/news/national/article3330921.ece. Retrieved 2012-04-19. ↑ "North Korea's Taepodong and Unha Missiles". Programs. Federation of American Scientists. http://www.fas.org/nuke/guide/dprk/missile/td-2.htm. Retrieved 2012-04-19. ↑ "North Korea says it successfully launched satellite into orbit". NBC News. 12 December 2012. http://www.nbcnews.com/id/50167891/ns/technology_and_science-space. Retrieved 2013=04-13. ↑ "Jericho". Encyclopedia Astronautica. Astronautix. http://www.astronautix.com/lvs/jericho.htm. Retrieved 2012-12-14. ↑ "Israeli Arrow ABM System is Operational as War Clouds Darken". Israel High-Tech & Investment Report. November 2002. http://www.ishitech.co.il/1102ar1.htm. Retrieved 2012-04-19. ↑ "ICBM". Encyclopedia Britannica. 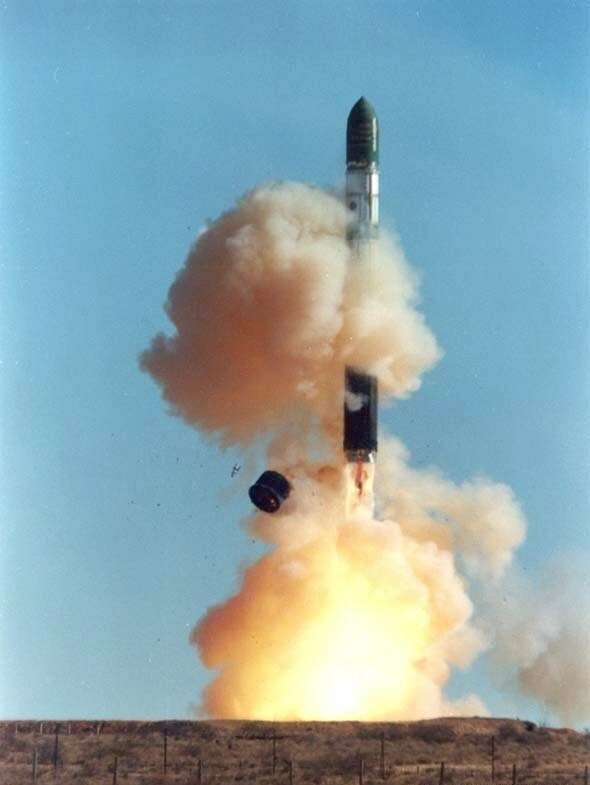 http://www.britannica.com/EBchecked/topic/290047/ICBM. Retrieved 2012-04-19. ↑ "Asia". The BBC. http://www.bbc.co.uk/news/world-asia-india-17765653. .
↑ Edwards, Joshua S. (20 September 2005). "Peacekeeper missile mission ends during ceremony". US: Air force. Archived from the original on 2012-07-17. http://archive.is/6vOy. Retrieved 2012-04-19. ↑ Norris, Robert S; Kristensen, Hans (January/February 2009). "Nuclear Notebook: U.S. and Soviet/Russian intercontinental ballistic missiles, 1959–2008" (PDF). Bulletin of the Atomic Scientists. Digital object identifier:10.2968/065001008. http://bos.sagepub.com/content/65/1/62.full.pdf+html. Retrieved 2012-12-14. ↑ "Second RS-24 regiment begins combat duty". Russian strategic nuclear forces. Russian forces. http://russianforces.org/blog/2011/12/second_rs-24_regiment_begins_c.shtml. Retrieved 2012-12-14. ↑ "Five types of missiles to debut on National Day". Xinhua. 2 September 2009. http://news.xinhuanet.com/english/2009-09/02/content_11982723.htm. Retrieved 2010-04-06. ↑ "DF-41, CSS-X-10". Weapons of Mass Destruction. Global security. http://www.globalsecurity.org/wmd/world/china/df-41.htm. Retrieved 6 April 2010. ↑ "DF-41 (CSS-X-10; China)". Jane's Strategic Weapon Systems. Jane's Information Group. 2 July 2009. http://www.janes.com/articles/Janes-Strategic-Weapon-Systems/DF-41-CSS-X10-China.html. Retrieved 2010-04-06. ↑ "Type 094 (Jin Class) Nuclear-Powered Missile Submarine". Sino defence. http://www.sinodefence.com/navy/sub/type094jin.asp. Retrieved 2012-12-14. "Missile Defense Agency". Department of Defense. http://www.mda.mil/. .
"Estimated Strategic Nuclear Weapons Inventories". Rice. 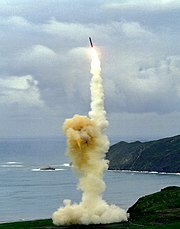 September 2004. http://es.rice.edu/projects/Poli378/Nuclear/f04.stratg_invent.html. .
"Intercontinental Ballistic and Cruise Missiles". FAS. http://www.fas.org/nuke/guide/usa/icbm/. Hawes, Kingdon R. "King", Lt Col, USAF (Ret.). "A Tale of Two Airplanes". RC135. http://www.RC135.com/. .